Japanese anime, manga and game news resource Otalab has recently published an article releasing new details surrounding the much-speculated upon third season of Cardfight!! Vanguard. The third season will be starting in January of 2013, and will, as previously promised, once more follow main character Sendou Aichi, this time as he enters into high school. This plotline appears to be based on recent chapters of the manga, in which Aichi transferred back into Miyaji academy for high school, joining Misaki and his sister Emi at the academy with Tatsunagi Kourin as his new classmate. 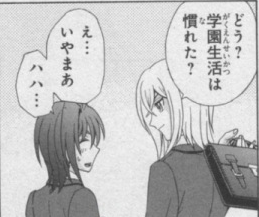 Unlike in the anime, Miyaji was not stated to be an all-girls' school; whether Aichi will enroll in Miyaji or Hitsue High for the third season is unclear, as is whether or not Misaki will be cutting her hair as she did in the manga. The third season has just recently been established as having Japanese rock band Psychic Lover perform its opening, making this the first opening sequence not performed by JAM Project. The January air date has confirmed the idea that the Circuit will end at under 65 episodes, unlike the first season. Currently about to air its 35th episode with only five air dates remaining and three more episodes currently announced, the Circuit is projected to end at ride 104, for 40 episodes in the season.